White Chalk and Blackboards are Being Replaced by PowerPoint, Flat Screens and Innovative Classroom Furniture to Accommodate this Evolving Environment The HON Company’s new SmartLink(TM) furniture system connects the teacher, the students and the environment together in a uniquely synergistic manner designed to foster an interactive learning process. MUSCATINE, IA–(Marketwire – August 19, 2008) – Rest in peace, dear #2 pencil. Same for you, 3-ring binder. For years, you were at the top of back-to-school shopping lists for students around the country. Instead, you have been replaced by ink cartridges, laptops and jump drives. And the face of the American classroom itself is evolving as well — chalkboards and transparencies are being replaced with flat screens and digital projectors. Today’s classrooms also focus on collaboration and teamwork, requiring a more flexible work environment. Teachers are more interactive and mobile than in previous generations, leading to the crumbling of the traditional, hierarchical "teacher in the front/rows of students"-type set-up. To determine the needs of today’s classroom, The HON Company, a leading office furniture designer and manufacturer, interviewed teachers, principals, administrators, students and designers. The result? 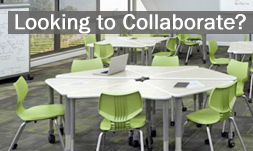 SmartLink™ — a revolutionary classroom furniture system. This unique technology-centric furniture solution connects the teacher, the students and the environment together in a uniquely synergistic manner designed to foster an interactive learning process. "SmartLink takes into account the changing needs of schools, such as technological needs, flexibility, storage and organization," said Jim Cahill, HON’s vice president of systems and education. "The fact that it’s mobile allows teachers to easily reconfigure any classroom to facilitate interactive learning or to better support their own teaching style." Cahill noted that a comprehensive solution, such as SmartLink, is new to the education market. In the past, education professionals had to purchase classroom furnishings and storage options from multiple suppliers, making seamless integration difficult. The introduction of SmartLink has revolutionized the way classrooms can be designed and utilized — not only for today’s needs but also those of the future. SmartLink’s four key components include a teacher station, modular storage, a wall rail system and a student desk. The products visually integrate to provide a holistic solution that supports space utilization and a variety of learning styles, as well as a variety of technology requirements. The innovative design of this durable, adaptable piece of furniture offers ample work and storage space that can accommodate multiple teaching styles, classroom layouts and technology needs. As a mobile station, it can be easily repositioned within the classroom. As a desk, it can organize and manage teaching materials, equipment and technology, and provides ample storage for files, books and magazines. From pencils, paperclips and markers to pipe cleaners, laptops and backpacks… keeping today’s classroom organized is definitely a challenge. HON’s solution? A modular storage system that adapts to the needs of different classrooms by employing a variety of trays, shelves and cabinets that can accommodate any classroom configuration. "The reaction to our modular storage solution has been phenomenal," added Cahill. "It’s not that teachers aren’t organized — it’s that they’ve never had the right equipment to allow them to get organized." The unique wall rail system delivers better use of wall and floor space, even in the most space-challenged classroom. Its multifunctional, multi-track rail allows sliding and reversible presentation boards and worksurface solutions to be configured in numerous ways. These components, which literally hang off the rail system, can easily accommodate and organize different teaching styles and facilitate several learning activities at one time. SmartLink student desks provide a multi-functional solution capable of increasing student productivity and enhancing learning activities, including individual, group-collaborative and teacher-centered work. The triangular desktop shape and ergonomic user edge offers comfort and support, while the wire basket and backpack hook keeps all essential materials within reach. The adjustable height ranges from 22 to 32 inches in 1-inch increments, which means the same desk can allow students of all grade levels to sit comfortably. Tops on student desks are large enough for notebooks and laptops and are "non-handed," providing greater arm support to both right- and left-handed users. The desks themselves are lightweight and can be easily configured into individual rows or collaborative configurations, which is further facilitated by the shape. HON products are available through its authorized dealer, Worthington Direct, the leader in discount school furniture.